The first Jewish community in North America was established by twenty-three Jews who fled the Portuguese conquest of Dutch Brazil and arrived in New Amsterdam in 1654. By 1775, there were 2,500 Jews in the New World. The Jewish community supported the American Revolution and approximately 100 Jews joined the Continental Army and state militias. The religious freedoms supported by the early American government ensured that Jews felt at home in their new surroundings. 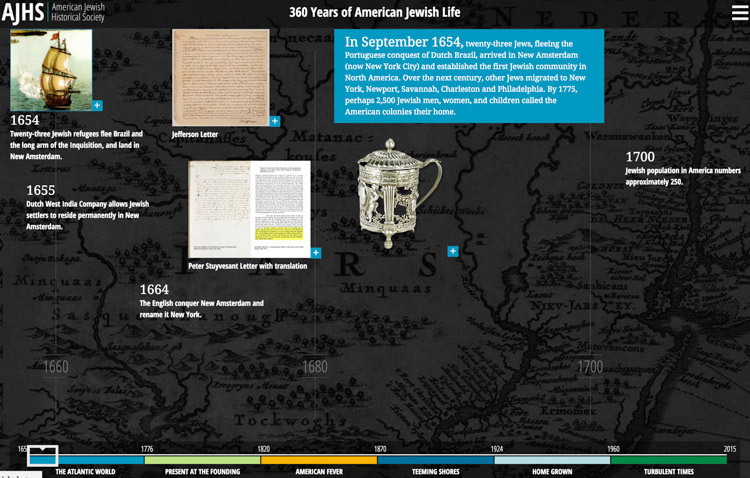 Follow 360 years of American Jewish history, from the first Jewish community in New Amsterdam in 1654 through the present day. Connect with the stories of Jews in America as told through AJHS’s archival collections.